China Glaze For Audrey + Konad Fishnet = Awesome Nails! It rarely happens, but I actually managed to wear un-boring nails to work for one entire week! It was during the Christmas season, so I didn't have any client meetings, and both my bosses were on leave for the holidays. So a thought popped into my head - since I wasn't going to be doing much work that required me to look professional, why shouldn't I jazz up my nails? Thus, I promptly combined China Glaze For Audrey with the awesome fishnet/lace print on my nails. China Glaze has a few colours that are famous, and For Audrey is one of them. It's purportedly named after Audrey Hepburn for her role in Breakfast at Tiffany's, and the colour was apparently created to be the same shade of blue-green as a Tiffany's box. Now is that cool or what? I know most people who are more colour-shy won't see turquoise as a colour is classic, or for that matter, classy. But if you think about it, what can be more classy than a Tiffany's box? And if a Tiffany's box is classy, why shouldn't we wear that gorgeous colour on our nails? So behold, my awesome manicure the colour of a Tiffany's box! It's absolutely gorgeous, and in some lights it looks more blue, but in others it looks more green. I can't quite decide whether it's more of a blue or a green. Alright, yes, I was a klutz with the konad. 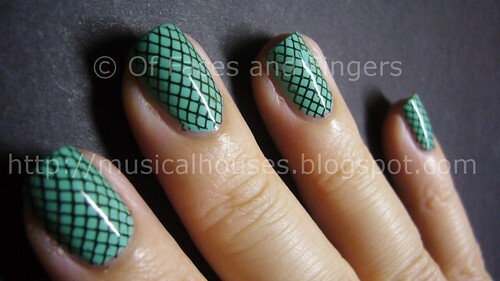 I used my all-time favourite (and oh-so-cheap) black nail polish for the fishnet/lace print, Wet n' Wild Black. And the design came from one of my favorite konad plates of all time, M57. Back then when konading was a new thing, the M57 plate was so hard to get hold of, because every nail polish fanatic wanted one, and it was perpetually out of stock. After applying China Glaze For Audrey, I can definitely see why it's a classic. This colour was trouble-free in it's application - in fact, it virtually applied itself. It was fully opaque in two coats, although I suspect if you do thicker coats, you could get away with one. And it didn't streak at all. I enjoyed painting on this colour. Wet n' Wild Black, which was used for this konad to imprint the lace/fishnet pattern, is one of the fan favourites of nail polish addicts for konading. It's cheap, it's black, and it works well with the konad stamp and plate set. What's not to like? Lasting power was about average - it lasted about 4 days on me before the first chip appeared, which was pretty usual. I don't have any complaints about the lasting power of China Glaze polishes in general. Some brands have trouble staying on my nails (ahem, Zoya and Barielle, I'm looking at you! ), but China Glaze isn't one of them. I don't know about you, but I was in love with my nails for the time I wore it. Everyone I met commented on my nails, from fellow colleagues to sales staff I would encounter on the way hhome from work. It actually pained me to remove the colour when the holiday season was over and work started picking up again at the office. Of course I had to take it off and replace it with a more sensible, work-appropriate colour. But at least I got to have funky nails for awhile! I really like it - it's one of those cool pastel colors that reminds me of mint ice cream. The fishnet is a nice touch because it compliments the nail well. I haven't had funky nails myself in a while. I've been going for manicures that are quick and simple. I think I've gotten into the comfort rut of not wanting to make the time for my nails. It's always fun to change it up a bit. You have so much more patience than I do by the way :) Looked great. That is such a cool manicure. Love it. oh!!!! love love LOOOVE IT!!!! go girl - u risk taker u!!! ;) I love the color... I recently used Revlon's "minted" which is a similar color but "for audrey" def has more blue. i look forward to more posts from you!!!! I remember thinking how freaking awesome your nails were when you posted a pic on twitter. I really need to get a Konad stamper! This is amazing! I really need to get my hands on a konad system. This is definitely one of the best nail looks I have seen. As soon as I saw this post in Google reader I knew your bosses were off again! Beautiful nails, it's a shame you can't wear more creative ones when you see clients. Wow, I can't believe the WnW polish shows up so well!!! I have a Zoya one that is SUPPOSED to be great for Konad, but no, it isn't. I plan to go get me some of the WnW Black tomorrow! Thanks! amazing nails!!!!!!! i adore this color, and the pattern is really cool! That's insanely cool! I've never heard of Konad plates before - are they easy to use? It looks like you need quite a lot of kit? oh wow! that looks awesome! i need to get me that fishnet template! do you know which plate number it is? @audrey: It's mentioned in the blogpost somewhere, but the plate number is M57, one of my favourites! @Annie: Konad is like a stamping kit, you basically stamp a nail polish pattern onto your nails :) I'm not too good at explaining, but if you google "konad tutorial" tons of stuff will pop up! That is some piece of an art. I really like it.